Shuttle click is a mikroBUS™ socket expansion board, which provides an easy and elegant solution for stacking up to four click boards™ on a single mikroBUS™. It is a perfect solution for expanding the capacity of the development system with additional mikroBUS™ sockets when there is a demand for using more click boards™ than the used development system is able to support. Shuttle click can be especially interesting for the development systems that are equipped with a very small number of mikroBUS™ slots, such as the Clicker family of development systems. Using Shuttle click on such system will greatly improve its usability by adding more mikroBUS™ sockets, yet it will remain small, compact and manageable. Shuttle click consists of a high-quality PCB that can be connected to the mikroBUS™ as any other click board. The central part of the Shuttle click is populated with the four ICD BOX headers. 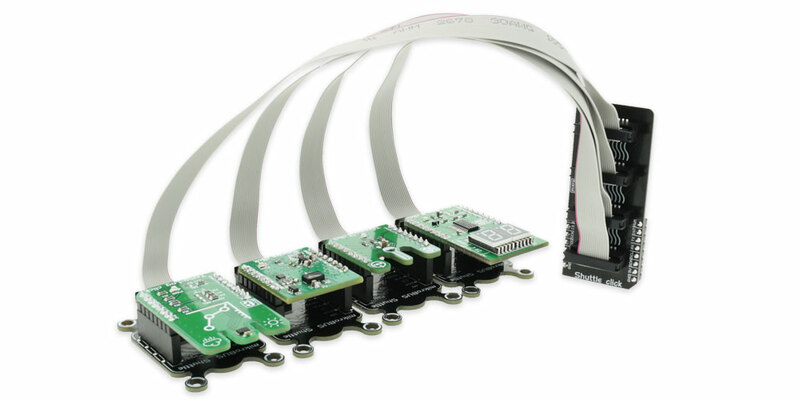 Each of these four headers is used to connect to the same type of header on the add-on board, also known as mikroBUS Shuttle, by a flat ribbon cable. Thanks to the ICD BOX headers, the connection remains firm and stable. Besides the ICD BOX headers, these mikroBUS Shuttle add-on boards also have one mikroBUS™ equipped, so that the click board can be securely fitted to it. Having this kind of stacking topology, allows for easy manipulation and reconfiguration of the stacked click boards™, retaining a perfect connection quality at all times. When there's a need to expand the development system with even more mikroBUS™ slots, one of the free mikroBUS shuttles can be populated with yet another Shuttle click, allowing even more connections. This makes the stacking capacity almost unlimited. However, attention should be paid not to make mikroBUS™ lines too long. In situations like this, the frequency of the communication might need to be stepped down a bit, in order to compensate for the longer mikroBUS™ signal lines. Lines of the mikroBUS™ to which Shuttle click is attached, are shared through all four ICD BOX headers - each of the four ICD BOX 2x8 pin headers mirrors pins of the connected mikroBUS™. Therefore, each mikroBUS Shuttle add-on board shares the same mikroBUS™ pins as the other mikroBUS Shuttles connected to the same Shuttle click. For this reason, an extra care should be taken when working with click boards™ that share the same pins on the mikroBUS™, either for the communication (SPI, UART, I2C) or for some other purpose (RST, INT, or other pins used as GPIO). For example, I2C and 1-Wire protocols are designed with stacking in mind, so the collision avoidance mechanisms are already in place for these protocols. It is enough to change the slave address of the click board™ and data collision won't be a problem anymore, even while sharing the same pins for the communication. Also, since all the stacked click boards™ share the same power rails, a care should be taken when combining click boards™ with significant power consumption. The power consumption from all the click boards™ combined should not exceed the maximum power that a development system can deliver. The union of Shuttle click, mikroBUS Shuttle and click boards™ allows you to reach an unlimited number possibilities when it comes to combining different functionalities. You just need to choose the ones you want from our ever-growing range: environmental sensors, LEDs, speech recognition, heart rate sensors, motor control, GSM, GPS, WiFi, analog to digital converters, movement sensors. More than 400 click boards™ that can be stacked and integrated in a simple and convenient way are at your disposal. Turn your development system into a mikroBUS shuttle station! Applications Provides easy, secure and reliable stacking of up to four additional boards per mikroBUS™ socket.